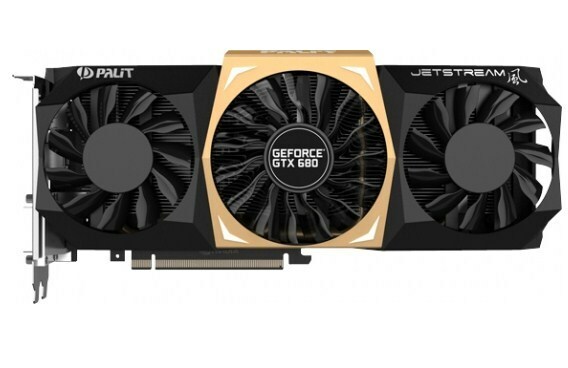 Palit has announced another variant of its GTX 680 graphics card with this particular JetStream edition shipping with 4 gigabytes of DDR5 memory for the ultimate gaming performance on high resolutions! The GTX 680, currently the flagship GPU for Nvidia, on reference cards shipped with 2GB of memory. But the need arose for those who didn’t tend to go for SLI on their large screens due to memory shortage and preferred to stick to single GPU setups. Soon enough Palit heard out the cries of our gamers and came up with this. The card comes with DrMOS and packs a 6+2 Phase PWM that enables the card to perform 12% better when compared to the 2GB JetStream variant. The card sure does pack an amazing look with its triple fan design and also features LED lighting across the card. Check out the press release below for more details.